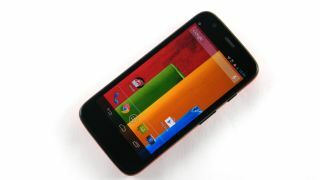 It seems that Motorola isn't resting on its budget based laurels, as it looks to crush the Moto G in the price stakes. Talking to TrustedReviews, Motorola CEO Dennis Woodside questioned a need for higher price points saying "why can't these devices be $50? There's no reason that can't happen so we're going to push that." This would give the potential device a price tag of about £30 (AU$56), a saving of approximately 75% over Motorola's cheaper handset, leaving it to compete against the more expensive feature phones and super budget smartphones. The Moto G was expensive? Unfortunately, we might not see the baby Moto G reach our shores as it may be targeted at emerging markets, with Woodside commenting "in much of the world $179 is a lot of money so there's a big market at a price point of less than $179". Details as to when we might be able to see this super cheap handset, or just what could be inside are also missing, but needless to say we're not expecting a massive HD display or a bundle of cores. Woodside may also have let slip a few more details regarding further customisation and Motorola's Project Ara modular smartphone, saying "Today you have colours and beginning of materials but you don't have screen size and you don't have functionality and we're going to bring all that in in the next year or so."